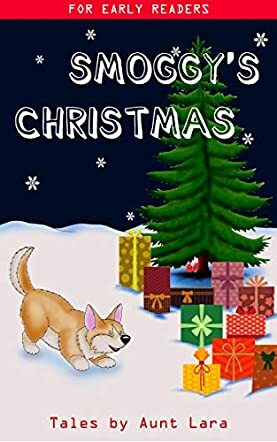 Smoggy's Christmas (A Short Story For Early Readers): A Story About Helping Others by Aunt Lara is the story of Smoggy, the dog with brown and white fur. His eyes always shone bright and he loved to play fetching balls. Smoggy had many doggy friends and they loved it when it was sunny so that they could go out and play. Smoggy loved winter better when it was all snowy and when it began snowing, Smoggy built a snowman with his friend Sammy. The next day Smoggy and Sammy went with Mommy to the mall and Smoggy liked a pretty little red scarf with snowflakes. What does Smoggy do with it when he gets it as a Christmas gift? The story captures the essence of the Christmas season and encourages young readers to help others and make them happy just like Santa's elves. It is adorable to watch Smoggy help the snowman. Christmas season is all about giving and receiving, and Smoggy's gesture is adorable. The illustrations are colorful and lively and they bring the characters and the story alive to readers. The message makes this a must-read storybook for children at home and in schools, and will motivate them to help others, especially during the holiday season. The book is a good Christmas and New Year gift to children and will definitely bring a smile to their faces. Tutors and educators can use it in classrooms and school libraries to spread the Christmas cheer and encourage youngsters to help others.